Having a website is not enough anymore. You want a website to increase leads and increase sales. 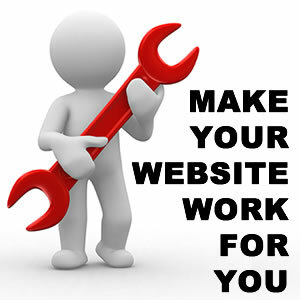 On a periodic basis take stock of your website and start optimizing. Do all your pages have a call to action? Lead visitors to perform the actions you want. Are all your pages search engine optimized? Use keyword friendly URL’s and ensure you are using the right keywords on the page. Do you have share buttons on your pages to increase engagement? Encourage visitors to share your content on their social media networks. What pages have the most traffic? How can you create related content? What pages have the least traffic? How can you make it a traffic magnet? What pages have high bounce rates? How can you make it more sticky? Are you running online and offline marketing campaigns? If not get started. What campaigns are working? How can you duplicate the process? What campaigns are not working? Do you need to scrap it or can you improve it? The easiest way to keep content fresh and to regularly update your website is to blog. Awesome content will keep visitors coming back and frequent blog posts will keep search engines coming back. Many people may let finding new content be a barrier to blogging. For some industries it may seem impossible. The easiest way to start blogging is to answer every question you have ever been asked by a client. Brainstorm every question you have been asked about your business, industry, products you use, your process, your services, your guarantee etc. and answer it. Create a blog post that answers each question. Keep optimizing your pages and blogging and watch the leads and sales increase. Dwainia Grey is an online marketer at Awesome Biz Online. She creates awesome websites and blogs for businesses as well as working with companies to optimize their websites with Search Engine Optimization and Social Media. She can be reached at Awesome Biz Online or by phone at 647-799-1090 x 104. You a can also follow her on Facebook to get the latest on online marketing.